The trip to Animal pass has been planned by the organizers of Bangalore Trekking Club, Gaurav Kamath and Monisha. A total 12 trekkers, including organizers set out from Bangalore airport, on 29th Septermber,2017. The whole trip was planned for 5 days, excluding travelling days. 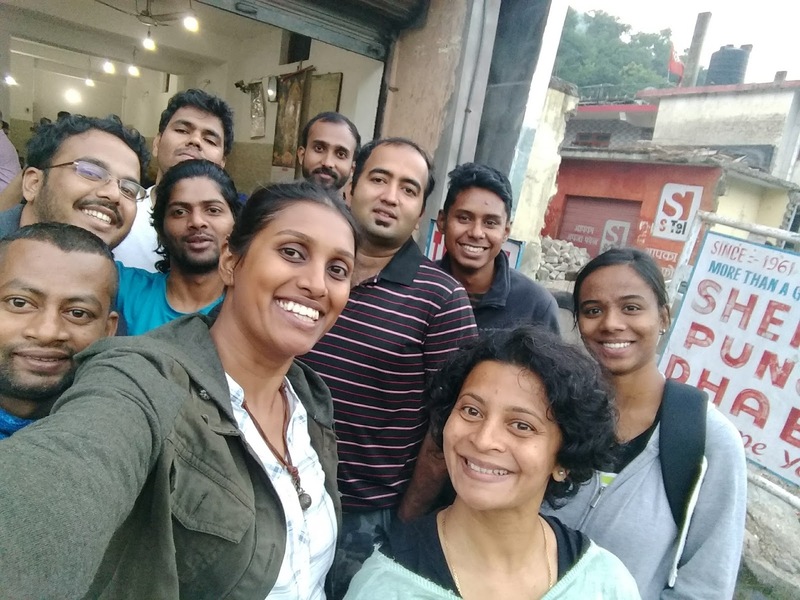 We took different flights from Bangalore, suiting our convenience, and reached Delhi. Then took a metro, to ISBT Kashmir Gate, via New Delhi Railway station. Our Volvo bus from Himachal state bus transport was scheduled at 7 pm. It’s a conscious decision, to take the bus from State road transport, as it is considered as safe option to travel, in tricky and arduous mountain curves. We have reached Bhuntar, small sleepy town of Himachal Pradesh at 9 am on 30th Sept. Bhuntar also has an airport and there is an option of reaching it from Delhi, by flight. After refreshing at Bhuntar, we set out in two sumo vehicles to Tosh village, from where our trekking on foot was scheduled to start. 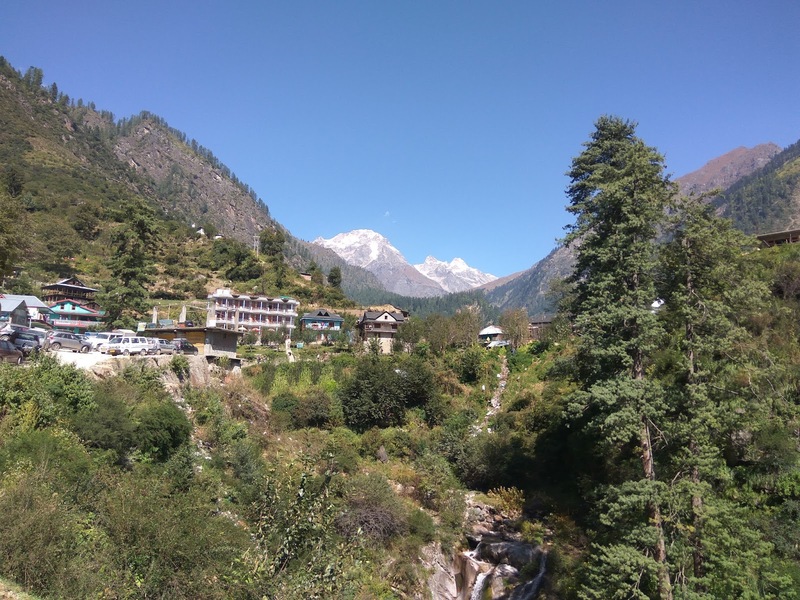 We have reached Tosh village in 2 hours, passing through Manikaran, famous pilgrimage centre for Hindu and Sikh, and also for hot spring bath. We have decided to visit the place on our return to pay obeisance to Lord Siva. We reached Tosh village by 1 pm. Tosh is a beautiful rocky village, which is around 7800 ft MSL. 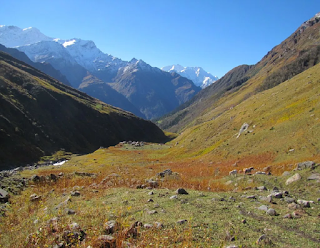 Tosh valley trek, is a trail that will take across the periphery of the mighty Himalayas.It is avillage at the end of the Paravati Valley in Himachal Pradesh. Locals told us that there was a snow fall on the upper mountains a week ago and we could not contain our excitement. Our guides for the trip, Mr. Sandeep and Pinku joined us at tosh village. After having light lunch at Tosh, we set out for our trekking at 3 pm. After trekking for one hour, we have reached a beautiful watery hole, where we had our tea. Initial part of the trek from Tosh, is quite steep. So, we kept our pace slow to enable us to acclimatize for the long journey. We were told to take frequent sips of water to avoid any dehydration. We trekked for further one hour, through the breath taking mountainous curves, and reached our first camping site, BUDDHABAN, around 9000 ft altitude. This is a small plain surface, surrounded by mighty hills, and view has taken our breath away. On the first day of the trek, we have covered around 4-5 km. Camping sites, were done by three helpful assistants, who were also doubled up for preparing food. They have brought all the required food items on the mules. Four of us, have also used the mules, to carry our backpacks on mules. Majority of the group has preferred to carry the backpacks, weighing around 10-15 kg. We spent our night in the camping site, after having dinner, prepared by the supporting staff. It’s a exhilarating feeling, to have a food, in the lap of mighty Himalayas. During dinner, our team leader has elaborated next day plans, and told us, to start by 7.30 AM. Night temperature, in these areas is around 10-15 degrees. Next day early in the morning, our team leader, made us to do some warm-up exercise, to make ready for the long trekking of around 10 km. After having breakfast by 7 am, we started our second day journey (1st October, Sunday). We have also packed our lunch. Day was clear with clear sun, and we passed through beautiful streams and greenery mountains. In this stretch of walk, we have come across lengthy ridge walk, and care required to be taken on every step. Most of our trekking is through shade of trees, and we hardly felt a sweat. After four hours of continuous trek, we have stopped for our lunch break. We have trekked further two hours, to reach our second camping site SHAARAM THACH, again a plain area, with water streams all around. Our mules, being much faster than us, have reached camping site, much earlier, and by the time, we have reached, camping arrangements, were already done. Our guide Sandeep told us we have reached around 11000 feet, and temperature is around 8 to 10 deg. Our team leader, has again made us to do light stretching exercises, to help us to overcome any niggle, after long trek. It really made us feel relaxed. Darkness sets early in this part of the world, and we were treated to wonderful evening, with cringing sun going down the mountains. Just behind our camping site, beautiful Parvati river is flowing, with gushing waters from the mighty Himalayas mountains. Throughout the night, we were hearing the sounds of the river, and it is really an intoxicating experience. Majority of our team member had only fitful sleep, due to new surroundings. We were also treated to gusty winds, in the early hours, as temperature has dipped further. On our 3rd day (2nd October), we started our day around 9.30 AM. We were told that we needed to trek for relatively lesser duration of around 3-4 hours. 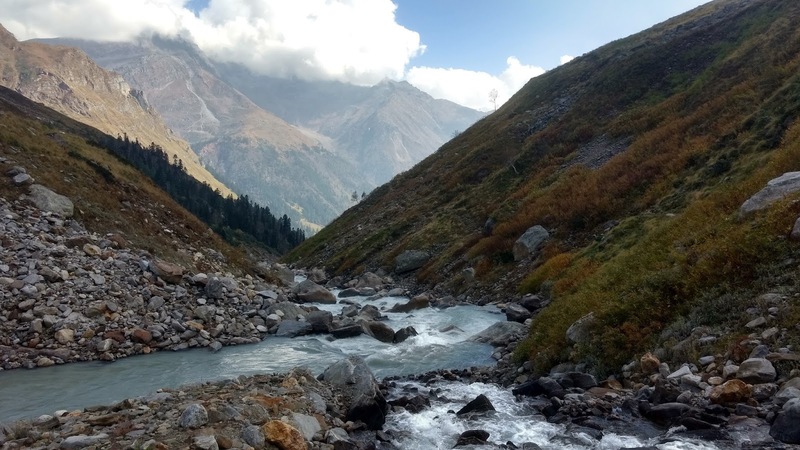 This trekking route, we have crossed through many rivulets, some are small and easy to cross, and some are quite long, as we have navigated through the stones, to cross these watery areas. We have also drunk fresh water from river streams, oozing out of mountain rocks, and common feeling is that, the water is best of any mineral water. We have reached our third camping site around 2.30 PM, SHAMSHI THACH, covering 7-8 km, a beautiful large plain area, surrounded by ice clad mountains. We could clearly see the fresh week old snow on the mountains, which appears, just a touch distance away. We had a grateful lunch and early dinner, prepared by our ever obliging supporting staff. We were told we have reached around 12000 feet. Our camp was surrounded by large number of sheep, with beautiful wool. It’s a sight to behold. After dinner, we were summoned by our team leader, to explain us next day plans of trekking to summit of animal pass, around 15000 feet. Our guide told us to expect the steep and difficult climb, and sometimes without trail. 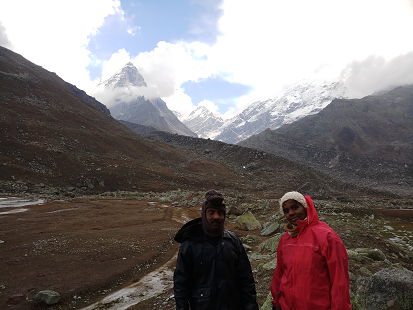 He told us, it may take 4 hours to reach a small river, called PANDAVA river, at the height of 15000 feet. 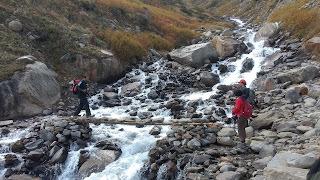 As he detailed the arduous next day trek, we all excited to take up the challenge. We set out at 7 AM, after having early breakfast and packed our lunch, for hiking to 15000 feet. As guide told us earlier, the final trail of 2500 ft are quite arduous and steep. The pace was very slow, and frequent halts were required. Finally, after trekking for 5 hours, we have reached PANDAVA lake, small picturesque lake. We were thrilled to see the lake and drank the water, which tasted heavenly. Complete team has celebrated with high five’s and a sense of fulfillment enveloped all of us. We piled up stones as a landmark and etched the letters ‘BTC’ on one of the rocks to celebrate our achievement. The ice clad mountains closely surrounded us and gave a blissful picture. After taking loads of pics, we started descending, which is equally challenging. After almost 5 hours of continuous descending, we have reached our camping site, Shaaram Thach. We were visibly tired after hectic day, but our adrenaline is at its high with a feeling of achievement of scaling 15000 feet. After a good night sleep, we started at 9.30 for our return back to plain, which also turned out to be final trekking day (4th Oct). The entire team set a very good pace, to reach tosh village at 5 PM, after 8 hours of continuous descending. 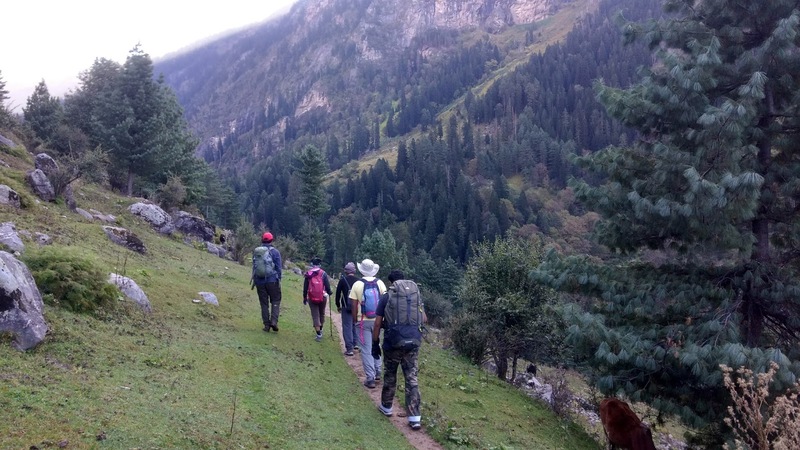 All in all, it was a fulfilling hike, leaving us with a feeling of coming back to the mighty Himalayas, adobe of Lord Siva, as soon as possible.